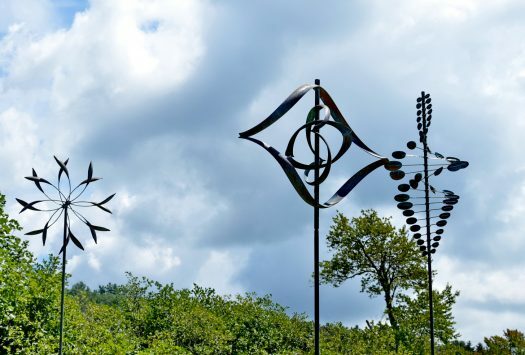 Molded from metal, chiseled in stone, forged by fire: discover the artistic trove of three outdoor sculpture gardens gracing the mountain landscape of Jackson County, North Carolina. From the homegrown sculptures of the Green Energy Park in Dillsboro to the elevated art experience on the Village Green in Cashiers, the outdoor collections evoke the spirit of the mountains. They run the gamut of moods and mediums, from whimsical copper to brawny steel to poignant marble. Some visitors take a day to scout the whole circuit. Others mosey by for a quick gander en route to a trailhead, between lunch and shopping, or before a show. 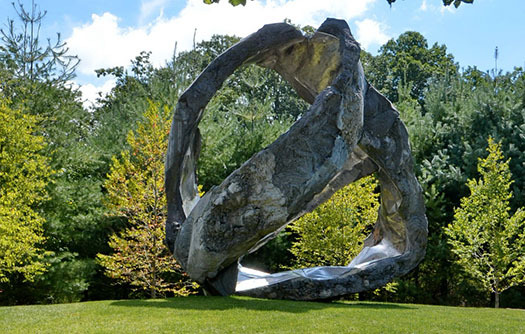 Play the role of art critic and find your muse as you explore the outdoor sculpture walks. Get creative with a sculpture photo safari. Or challenge the kids with an art scavenger hunt. That’s the beauty of our sculpture quest. You can make the adventure your own as you explore these hidden art gems of Jackson County. Here’s a quick survey of our three outdoor sculpture gardens to help you get your bearings. Meandering park paths weave through the 12-acre campus of the Village Green, replete with gardens and resting places, a spacious playground, a wetlands boardwalk and picnic spots. It’s located at the intersection of U.S. 64 and N.C. 107 in Cashiers. 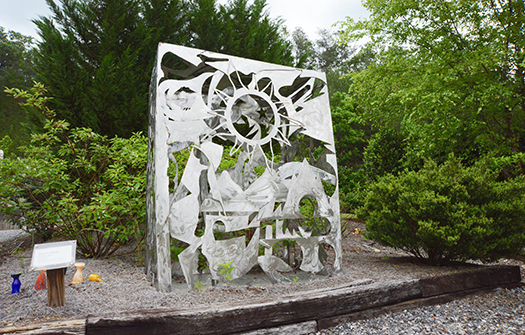 The mountain-ringed campus of Western Carolina University has nine outdoor sculptures to explore, courtesy of the WCU Fine Art Museum. 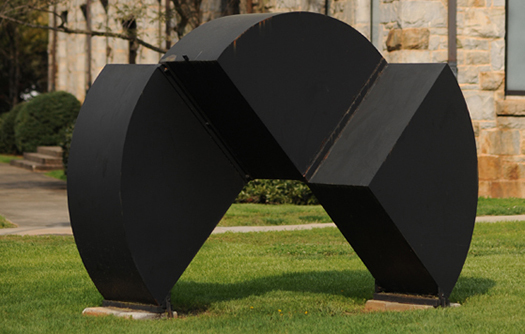 A black geometric arch titled “Eclipse” was the first public art installation 25 years ago. It’s now catapulted to the most-photographed work on the sculpture trail in the countdown to the Great American Solar Eclipse coming August 21. Jackson County has been named one of the prime solar eclipse viewing destinations in the path of totality. An interactive sculpture called “Dirtmaker,” symbolizing renewal and sustainability, joined WCU’s public art collection last year. A short jaunt down a wooded campus hiking path leads to the organic sculpture seemingly borne of the forest around it. Gently rock the giant drum by its trunks and lend your own hand to rejuvenating the earth beneath. You can chart your own course through the WCU sculpture trail using an interactive online map, but a good starting place is the piece simple called “Catamount” — none other than the WCU mascot — posted like a sentinel at the main campus entrance off N.C. 107 in Cullowhee. Harnessing green energy to fuel the arts, the Jackson County Green Energy Park houses studios for potters, blacksmiths and glassblowers. 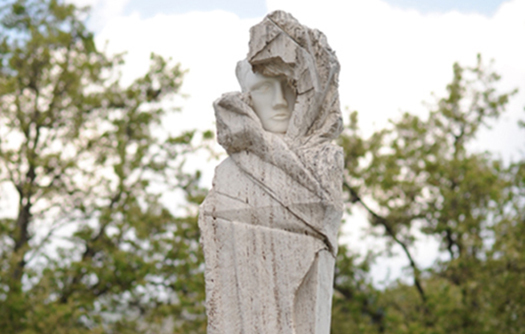 The working campus has a collection of sculptures, some made by former artists-in-residence and some selected through sculpture contests. The artists’ workshops at the Green Energy Park — from kilns and glass torches to forges and a foundry — are powered by methane captured from an old, closed-down landfill. After perusing the sculptures, take a guided tour of the complex or browse the onsite art gallery Thursday through Saturday. Located along Haywood Road off U.S. 441 on the edge of Dillsboro. To plan your visit to Jackson County, and see the stunning outdoor art for yourself, visit www.DiscoverJacksonNC.com.